Charleston Tea Planation: Unique in the U.S. But while the high heat, humidity, and heavy rainfall in the Lowcountry of coastal South Carolina is the ideal climate for cultivating tea, the plant needs four years before it can be harvested. Needing a quicker cash crop, the colonists planted rice, choosing to depend on British sources to feed their tea addiction, and we know how that turned out. 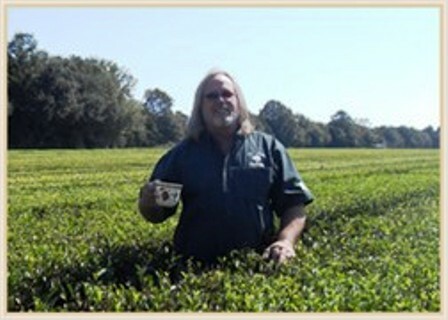 But in 1960, Bill Hall, a 3rd generation tea taster, decided to do what his colonial ancestors did not. Using cuttings from plants growing wild at the site of a turn-of-the-century tea growing effort, he started the only tea plantation in North America. At the Charleston Tea Plantation, long rows of knee-high, dark green plants – Camilla Sinensis, to be specific – look like boxwood hedges stretching across the plantation’s 127 acres. Egrets pick their way along the verges of the fields as they look for bugs. Deer sometimes appear in the shade of the live oak trees. Harvesting begins in early spring. The “first flush” is the best tea of the year. Only the top leaves are harvested; the sides and bottom leaves are bitter. Two to three weeks later, there’s enough new growth for another harvest. Depending on the weather, there are seven to ten harvests per year from April through October. 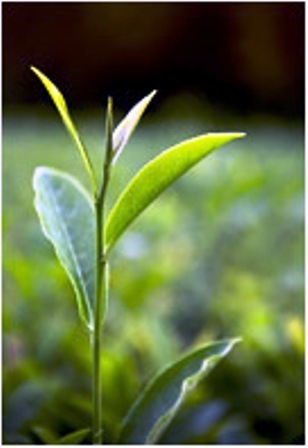 Tea is naturally insect and disease resistant, so no herbicides or insecticides are used. Traditionally, harvesting is done by hand. It would take 500 people to pick the leaves from the plants on the estate. Using equal amounts of imagination and scavenged parts from tobacco and cotton harvesters, Hall and his staff invented the “Green Giant,” a mechanical picker that harvests 5,000 pounds of tea at a time. The massive machine rumbles to the processing area where you can watch as the tons of leaves are dried, cleaned, sorted, and packaged – all within 20 hours of picking. It takes five pounds of leaves to produce one pound of tea. From needing 500 pickers, plus dozens of processors, the plantation operates with only four employees. 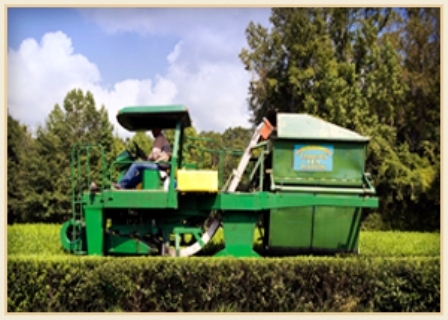 Research into tea is the primary reason for the plantation. A few years ago, Bigelow Teas partnered with Hall to support his innovations and study. The plant nursery is a greenhouse gardener’s dream. Computers control everything needed to thoroughly pamper the 1400 young tea plants: soil temperature and humidity are maintained at optimal levels; opaque screens and panels create the ideal sun to shade ratio. It takes about eight months for the root system to develop and the plants to be moved outside, and they are first harvested when they are four. But a mature plant produces tea leaves for hundreds of years. To a Southerner, sweet tea is as much a part of life as fried chicken, college football, and NASCAR, so it’s no surprise that the gift shop has free samples of iced tea brewed from the seven different blends of American Classic Tea brand tea the Plantation produces from the 320 varieties of tea it grows. The self-guided factory tour is filled with the aroma of tea and a lot of fun trivia. The Irish, not the Brits, drink the most tea. It’s the second most-popular drink in the US (after coffee). And 80% of the tea served in the US is iced tea. It’s 99% in the South. 6617 Maybank Hwy., Wadmalaw Island, SC. 843-559-0383.